When it comes to couple communication, here’s a request I get a lot. Sadly, many of the couples asking the question have been married for several years!By then they developed some awful patterns of communicating. In this lesson, I will address these common mistakes so you can avoid them as you are starting out. Did you know that the number one reason why couples seek counseling is because they do not know how to communicate? 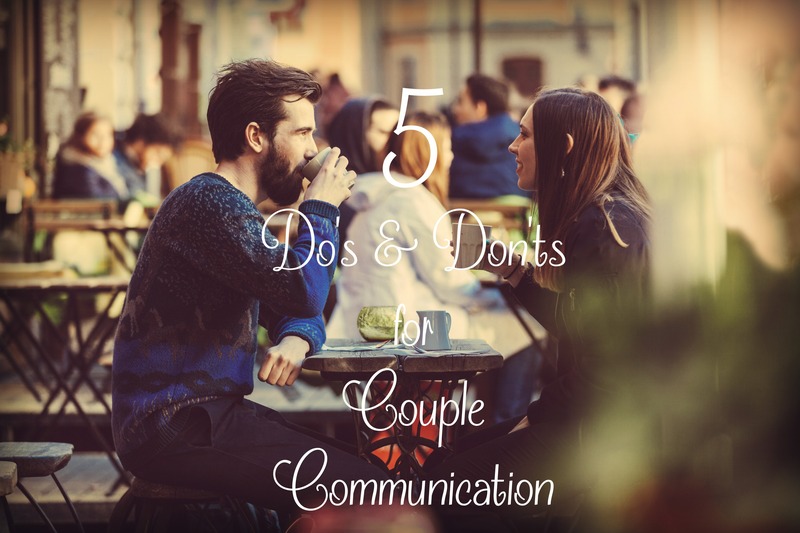 So, let’s look at the do’s and don’ts of couple communication. One major faux pas in couple communication is assuming your partner knows what you need when you need it. The mistaken belief is that couples in love are always tuned in at a deeper level. The reality is that your spouse is not going to be tuned into you 24/7. Another major faux pas is when couples make assumptions about what each other is thinking without checking it out first. Acting on what you assume your partner is thinking is not a good strategy and often fuels conflict. Now, let’s examine how to handle assumptions. Clarifying your need and asking your spouse for support is a reasonable request. It is not a sign of weakness on your part. Nor is it a bad sign if your spouse doesn’t know what you need at the time. Throughout married life we are students of each other. Students learn and get better at anticipating needs, but early on we all have to be taught. Talking over someone is a clear act of disrespect. You have something to say too, but if you interrupt your partner, the conversation may get off the rails. Next thing you know, your mate is talking over you and the interaction escalates. when they feel something negative coming from their partner. This is a knee-jerk reaction to defend oneself. Interrupting is rude and signals to your partner that you care more about your voice being heard than hers or his. Is this what you want? When you’re spouse is talking to you, show genuine interest. Stop what you’re doing, put down your device, and look her or him in the eye. This courteous act conveys respect. Sometimes you might not like or agree with what your spouse is saying. The temptation to interrupt is strong. Don’t do it! You’ll get your turn to talk. Hold back and let your partner finish talking. Slow down, be patient, and try to understand the gist of what he or she is trying to say. Doing this will help you both resolve the issue. Misunderstandings between couples can cause things to heat up really fast. Reactive dialogue has a rapid back-n-forth motion with a lot of talking and very little listening. When things heat up a couple is in danger of using harsh language. No one likes to be on the receiving end of this. Developing a pattern of harsh language will do serious damage longterm. Think before you speak. Not just what to say, but how to say it. The difference between a complaint and criticism is the tone you use. A tone of respect conveys your message more effectively. Among the furniture in your home is a hot seat. You can’t see it, but you will know when you’re on it. No one likes being on the hot seat. Yet, in every marriage one of you is going to be sitting on it! Mistakes, mishaps, and failures happen in every relationship. Because you are an imperfect person, with an imperfect spouse/partner, you have an imperfect relationship. Undoubtedly, you will do something wrong. Blaming your problems on your spouse is bad form! You have to own your faults and take responsibility for your actions. Assigning blame to your partner is a sign of weakness on your part and will build resentment in your spouse. Lies, diversions, or blaming others makes matters worse. Owning your mistakes is a sign of maturity that builds trust. When you are on the hot seat think repair. You want to repair the offense against your mate. If you like to get your way all the time, you will have an unsatisfying marriage. Your spouse may give in to you, but he or she will silently resent you. More often than not a protest will come in the form of some passive-aggressive behavior. You may win an argument but you will lose on something else that likely would not have occurred had you been open to a discussion. One-sided relationships have a short shelf life. When you have discussion about matters that have mutual interest, be open to what your spouse has to say. Give consideration to each other’s point of view. Try a collaborative approach in your communication, giving equal weight to each other’s point of view. Find compromise, seek win-win outcomes. Remember not to talk over each other. Listen well and summarize what you hear before you give your opinion. By taking this approach you are more likely to reach a mutually satisfying decision.